At one time I was the Manager of The Freeway Coffee House. One of the perks of this job was that I got to book the bands that played on Friday nights, the other perk was that I would sometimes be given merch by the bands as a thank you. 9 times out of 10 you book the bands that you know will bring in a crowd and the 10th time you take a chance on a band that you have never heard of but had such an amazing demo that you just want to see them for yourself. That is how I met Hamilton’s Kosmonaut. 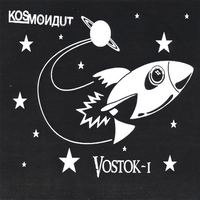 I was mailed an artsy little CD called “Vostok-1.” It was very fun and well thought out. Had sort of Russian Futurist feeling to it wrapped in a Weezer infused pop sound. I took a chance on booking them and 2 brothers showed up with just acoustic guitars. I was a little surprised and worried that I had booked the wrong band but their fans showed up and ordered lots of food, and the music was great. Even acoustically the songs stood up. I tried to purchase a shirt and a CD but the brothers were so happy to have gotten the gig that they wouldn’t let me pay and gave me both for free. I don’t think Kosmonaut is still a band but I did recently buy their self titled album from the discount bin at Dr. Disc and my 10 year old daughter heard me listening to them and she thinks they are great. She’s listened to the disc a number of times, so even if the band isn’t still around their music is still striking a chord with new listeners. 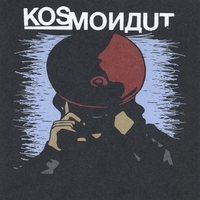 My Soviet Style Kosmonaut T-Shirt in this weeks picture still gets me lots of attention when I wear it. Some people love the retro quality and others get angry and tell me “that shirt is in very bad taste, the Soviet Union was evil, and I can’t believe you would want to wear that.” I let them know that “Kosmanaut is a good local band and it has nothing to do with politics”. This polarization of a controversial esthetic is also evidence that this little local indie rock band was hitting all the right nerves.